The fossil fuel lobby claims that we can't possibly reduce our fossil fuels consumption for the foreseeable future - but Carbon Tracker have ripped apart the assumptions on which these claims are based: over estimating population growth and economic growth, underestimating progress in energy efficiency and renewables rollout, and ignoring the potential for transformational change . By that Carbon Tracker means breakthrough developments such as battery storage but there are lots of other possibilities for fundamental changes that could shred the business-as-usual scenarios. We can already see the beginnings of a transformational change in housebuilding, away from traditional bricks and mortar and towards timber frame and other construction types. The new styles can be built more quickly without sacrificing quality and their construction generates less carbon emissions. The rate of house building in the UK now is the lowest it has been since 1950 and it will be hard to build up again without more skilled workmen such as trained bricklayers  - except we only need more bricklayers if we want to build more brick homes. The chart shows the peak in house building came in the late 1970s; in 1968, there were 425,000 homes built in one year of which nearly half were council homes. These days more homes are built for housing associations that local authorities and in 2013 there were only 140,000 homes built in total. It is possible to build homes very quickly if you work at it, though not with bricks and mortar where you are at the mercy of the weather. The City of Dublin plans to build 200 or so module based homes to house desperate homeless families - currently living at the taxpayer's expense in hotels. It is considering proposals from six manufacturers. One, from MOM Services Ltd can be built in five days plus one day for on-site assembly (for an 80 m2 two-bedroom home) . Obviously something that small won't suit everyone but there is great demand for affordable, small, functional homes for housing associations and first time buyers. LoCal Homes is a social enterprise set up to build low carbon homes using timber panels that can be assembled in as little as one day. They won the Best Social Housing project this year at the Structural Timber Awards . The homes they build use half the heating energy of comparable traditional homes and generate half the carbon emissions during the build process . They import timber from Scandinavia but their factory is in the UK . The carbon emissions generated in building a typical bricks and mortar house are typically around 50 - 60 tCO2: about 5-6 times the average annual emissions for a UK person. That is a lot - but you need to consider the emissions from heating the home as well. The chart below uses data from a report comparing carbon emissions for a small 2-storey home (160 m2) in 3 designs: traditional masonry, using SIPs (Structural Insulated Panels) and FACIT - a specifically low carbon design from FACIT Homes . Heating this home, based on current building regulations, and a lifetime of 50 years using gas for fuel throughout, would generate 78 tCO2 so in this case the construction emissions using masonry are only 40% of the lifetime total. On the other hand, if the home was built to Passivhaus standard, then the heating emissions would be only 23 tCO2; or if we move away from gas to a lower carbon heating fuel then the emissions due to heating will be less so the construction emissions will be the main part of the lifetime total. Carbon emissions during construction phase and from 50 years heating with mains gas, assuming energy efficiency as current building regulations (standard) or assuming Passivhaus energy efficiency . 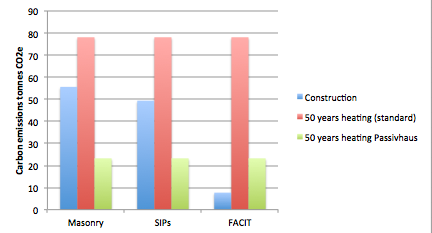 Not surprisingly, the FACIT report shows the FACIT design in a very good light whereas the SIPs construction is not much better than the masonry design. However, with a bit of ingenuity I am sure the SIPs emissions could be improved. Half the emissions for the masonry and SIPs homes come from the concrete footings and concrete slab ground floor (28 tCO2) whereas the FACIT home has a wooden floor with steel piles (1.6 tCO2). Also in the masonry case more than half the emissions from walls are due to bricks, blocks and mortar (9.5 tonnes) whereas in the SIPs walls the structural elements are relatively low carbon: the main culprit in the walls is the steel wire used to support the external render (6.1 tCO2). Steel making is a high energy, high emissions process but steel frame construction is the current standard for all high rise buildings. Fortunately, new materials made from wood could soon replace steel in most situation. Engineered timber is made from strips of softwood glued together. In 2009 when the nine-storey Stadthaus was built in London it was the tallest wooden building in the world. Now there are plans for a 30 storey tower in Vancouver . Summary of the main construction elements used in the FACIT report comparing carbon emissions of different constructions. All building elements have U-value 0.14 or less, comparable with Passivhaus standard. Floors Reinforced concrete ground slab and polystyrene insulation As masonry Spruce joists, spruce plywood, and warmcel insulation. Walls Exterior bricks and mortar, mineral wool insulation, blockwork, small cavity and plaster inside External render reinforced with steel wire, SIPs based on Kingspan insulation and plaster inside Cedar cladding, spruce plywood enclosing warmcel (cellulose) insulation, plaster inside. You cannot build high quality bricks and mortar homes quickly (especially if the weather is bad) or with low carbon emissions - but with modern construction systems you can. On-site work is minimised by doing as much work as possible in the factory: pre-cutting timbers and preparing panels to custom sizes. To scale up, you need to build more factories. In fact we need more factories anyway - the only question is whether they are making old fashioned bricks and blocks or timbers and panels. We could carry on with business as usual or we could grasp this opportunity and choose the transformational path to a low carbon, high speed future.